Remembered Fawn Boys – ValbyDane Great Danes. Kannon had a fan club wherever he went, because of his stellar personality and his presence in the show ring. He was a Group Winner, Multi Group Placer, Multiple Best in Specialty Winner, Award Of Merit Winner, and Multiple Best Puppy in Show Winner. We miss him every day. Kannon was bred by Peggy Mignon and Katie Chappelle and owned and presented by Peggy Mignon, ocasionally presented by Katie Chappelle. Rave was lovingly owned and presented by Peggy Mignon. Justus was loved and is sorely missed by Dave Heron, Arlene Dufour, and Peggy Mignon. Two show weekends was all it took for Bram to attain his Championship from the Junior Puppy classes - seven points, Best Puppy in Group and Best Puppy in Show. Then he finished in style his second weekend by taking Best of Breed over seasoned and distinguished, Best in Show winning Specials. What a start to a very promising career!! Thank you to notable judge, Richard Lopischuk for acknowledging this young man his first weekend out. Thank you to judge Kathleen Hardwick of New Zealand for finding this boy in a very strong and impressive ring, awarding Bram his finishing points in the shape of Best In Breed!! Bram was very competitive in the Specials ring. He didn't take long to become a multi group winner, multi group placer, and a Reserve Best in Show winner. In August of 2008, he took an Award of Merit at the GDCC Western Division Regional Specialty. Bram was bred, owned, lovingly presented, and is missed by Peggy Mignon. Bryce was a multiple Group Placer and Best Puppy in Group Winner. He was lovingly owned and presented by Peggy Mignon. Diesel is lovingly owned by Steven, Christa and Brook Arsenault of Calgary, Alberta. Diesel is professionally presented by his breeder and handler Peggy Mignon. Tonka was lovingly owned and sorely missed by Margaret Hurcelson of Fort McMurray, Alberta. 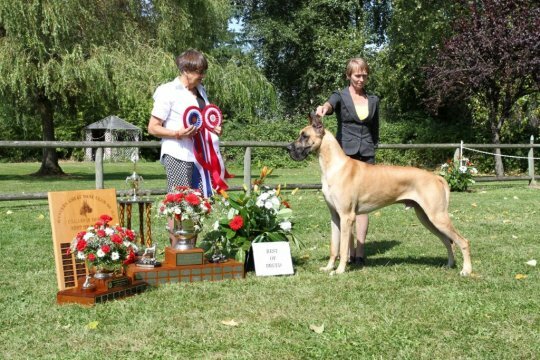 Tonka is presented by his breeder Peggy Mignon and occasionally by Marni Kueber. This young boy was taken from us much to early and will sorely be missed by his people – Leslie and Lee Squirrell and his breeder Peggy Mignon. A beautiful boy with a sweet and loving disposition. This young man has done exceptionally well in his limited show career by obtaining his Championship title in one show weekend from the Sr. Puppy class with the following wins - BW, BB over Specials, BOS over Specials. Rogue continued to prove him self in the conformation ring by taking BB, at 15 months of age, at the 2001 GDCC Western Division Regional specialty under breeder/judge Jane Trieber.